Canadian companies need to see Twitter as a vital pillar of marketing today, not just an occasional side dish to complement traditional ad campaigns. Three leading marketers delivered that message during a Twitter-sponsored panel session called ‘The Power of a Tweet’ on Wednesday. It was held on the third day of the FFWD Advertising and Marketing Week conference in Toronto. “Twitter is a hard working marketing tool for us, not a once-in-a-while thing,” said Kristi Karens, director of media for consumer engagement and agency partnerships at food and beverage giant Mondelez International. Karens and her two fellow panelists explained how each of their firms used this Twitter strategy for specific marketing campaigns. We’ve broken down the highlights of each campaign as a case study on how marketers can use Twitter effectively – as well as the challenges they sometimes face in the process. (Image: Shomi). Dundas Square, Toronto, Jan. 5, 2015. 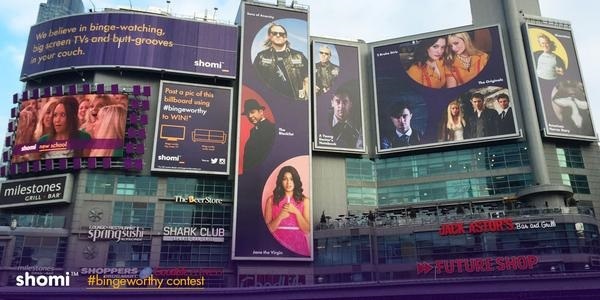 “We wanted to create buzz around the launch of Shomi and get the message out about the breadth of content on Shomi,” said panelist Rita Ferrari, director of brand and product marketing at the new on-demand streaming service recently introduced by Rogers and Shaw. What they did: Shomi combined digital with more traditional marketing activities to maximize reach. The Twitter campaign was projected onto a massive digital billboard at Toronto’s Dundas Square. Consumers were invited to take a photo of the billboard and post it on Twitter for a chance to win a new TV and sofa. Using Twitter’s ‘add to calendar’ function, users were also offered an easy way to set a reminder that the series Transparent would premiere on Shomi Jan. 23. What they got: On average, promoted tweets drove 2.3 times more traffic to Shomi’s website than organic tweets. The takeaway: “Twitter is a good vehicle” for entertainment industry marketing in particular, Ferrari said. That’s because “people are already having those conversations online” about the latest Walking Dead victim or Game of Thrones plot twist. Mondelez owns Cadbury, Nabisco, Trident and Tang. Its Canadian unit used Twitter to market Oreo cookies here during the Sochi Olympics. What they did: Mondelez Canada created a “war room” where staff tweeted real-time messages during live Olympic events featuring Canadian teams and athletes. Special Oreo graphics were created for the Olympics and tweeted when appropriate (i.e., an image depicting an Oreo cookie as a hockey puck appeared in tweets during a hockey game featuring the Canadian women’s team). What they got: Some of the promoted tweets hit engagement rates of as high as 24 per cent. The takeaway: Twitter can help convey the emotional impact of a brand, not just raise awareness of its physical product, said Karens. Tweets tied to live events carry risks but also give you the opportunity “to be seen as a real-time brand,” she added. What they did: Similar to the Oreo campaign, RBC live-tweeted as games unfolded during the most recent World Junior Hockey Championships. In the Tweet a Jersey campaign, fans could tweet RBC asking for their name to be inserted onto a graphic of a virtual hockey shirt. Afraid that an automated reply system would be open to abuse and misuse, RBC marketing staff personally moderated and responded to each fan tweet manually. What they got: Promoted Twitter content during the campaign increased positive brand sentiment for RBC by 200 per cent. The takeaway: Real-time marketing can mean really long hours. “Sometimes games didn’t end until 11 p.m. so I had a lot of late nights approving (virtual) jerseys well into the night,” recalled Hutchison. But real-time marketing also produces immediate metrics. “The beautiful thing (about social marketing) is you can know pretty fast whether something resonated or not,” he said.